The holiday season is also cold and flu season. Every winter people come down with fevers, runny noses, sore throats, headaches, sneezing, a nagging cough and an abundance of aches and pains. They’ll spend days if not weeks in bed trying to recover. But, this doesn’t have to happen. There are things we can do to prevent the flu, so we can enjoy the merriment of the season. The first step is to stay warm, and Warm Buddy can help us get all cozy with their plush products. I love all of them. 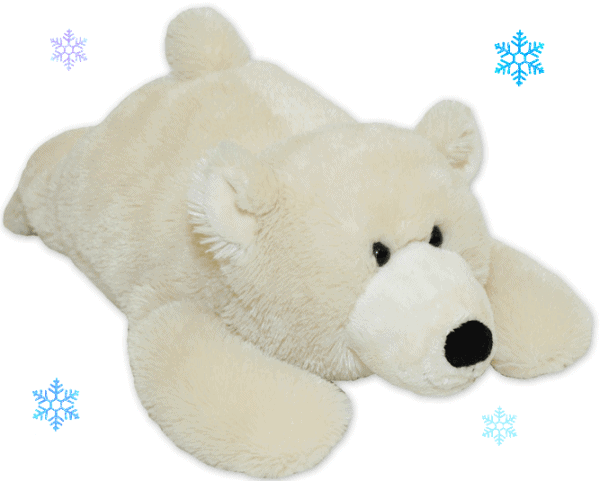 Warm Buddy is known for their plush heat therapy products with remarkable heat holding abilities. Their adorable Warm -Up Animals are very popular because they’re just so cute and cuddly. They also carry a variety of therapeutic spa products; some of which are infused with lovely aromatherapy scents. Their products will keep you snuggly warm, ease discomfort, soothe aches and pains and put you in a tranquil place. The Warm-Up Plush Animals are by far my family’s favorites. This year we got their new adorable Polar Bear. The plush Polar Bear is fairly large measuring 18″ long and made from the softest, fluffiest and silkiest fur to the touch. He’s opulently soft and perfect for snuggling when you don’t feel well. They’re so much nicer to embrace and cuddle up with than a rubber smelling, potentially leaking hot water bottle any day. The Warm-Up Animals can be used for both hot and cold therapy. On the Polar Bear, there is a velcro opening on his right side that houses the removable pack. The pack measures 7 x 5 inches and it’s filled with a natural ingredient, milled white rice, and it has a cotton cover and a polyester outer shell. The pack is made right here in Canada where standards are high. It’s very easy to cool and heat the pack. To cool, place in a plastic bag and then in the freezer for an hour or more. To heat, place in the microwave for 1 – 2 minutes on high. Caution is required because the pack can get very hot to handle, so only adults should handle this task. I only heat the pack for 2 minutes and replace it inside the Polar Bear’s tummy. We found the heat lasts approximately 2 – 3 hours before having to reheat the pack. The velcro strip seals the pack inside the bear fairy tightly, so it’s secure to use on children. The heat trapped in the Warm-Up Animals is soothing, relaxing and comforting, and everyone in my family loves them. All of the Warm Buddy products are made from high-quality materials, are hypoallergenic and have machine washable covers. With the Polar Bear being a light color, chances are I’m going to have to wash it at some point in the future. I already have a few of the Warm Buddy products and have washed our brown bear a few times on the gentle cycle. I then put him in the dryer for about 3 or so minutes just to fluff him up and then I air dry him. He’s quite durable, so far he’s maintained his shape, color and plush feel and several years of use. Secret code: cozy. The cushy Warm Buddy Animals are popular in my home. Kids love them as a reading and sleepytime companions. They also cheer a child up that might be having a bad day. They’re best friends who offer emotional comfort and a soft shoulder to cry on. Christmas is only a few weeks away and I can’t think of a nicer gift to give someone I care about. They come in a variety of different animals and retail from $29.99 – $39.99. Disclaimer: I received product and compensation for this feature. However, all opinions and views expressed here are solely my own, yours may differ. Would love to try a heat wrap! I’d love to try the Ultra Shoulder Wrap because of the chronic cervicogenic headaches I get and heat there helps. All your products sound lovely. I would like the Aromatherapy Sleep Mask. I’d like the Ultra Shoulder Wrap. I like the warming socks. My hubby needs these. The SPORTS THERAPY WRAP would be perfect for my husband! I love the Bear Paw Mitts! The Ultra Shoulder Wraps looks very good. I like the warming blanket. I would like to try the Warming Blanket to see if it would ease my aching bones and joints. Another product I would like is the Aromatherapy Mists. Warming Socks and the Warming Slippers for me. Living in a basement apartment means I unfortunately always, always have cold feet. I would love and need the sleep therapy set. this heat wrap looks so soft and comfy. Please count me int to win. Thanks. The Sports Therapy Wrap would be a great help to me! Would Love to Have The Warm Buddy Polar Bear!! I’d love the small puppy one, it’s just adorable! The warming socks look so cozy! The ultra soft shoulder wrap. I really like the Large Labrador plush warm up. I like the anti-stress shoulder wrap. I absolutely LOVE the sleepy time elephant! Omg my kids would love him, elephants are the theme animal for my littlest ones room! Love the idea of the Aromatherapy Face Mask. I use a mask but have never seen one like this. The Little Buddy Wooly is super cute too!!! I also like the warming blanket! I would also love to have the Anti-Stress Shoulder Wrap! This would be such a nice relief after a long day. I like the Anti-Stress Shoulder Wrap . I Would love to try a heat wrap! They look so cozy and cute! I would also love the Large Labrador. The puppy mitts looks so cute! Would love this Bear for colds this winter! Merry Christmas to all! I visited Warm Buddy and another product I would like is their BEAR PAW MITTS. My feet are always cold, so the warming socks or warming slippers would be wonderful! I love the bear and puppy paw mittens,they look so warm and cute! A Warming Blanket. I didn’t know this size was available anywhere. This would be wonderful when feeling down or once a month. I love that they have washable covers too. I really like the idea of the warming socks. Also, the lab puppies are adorable! Okay, the warming blanket is pretty awesome too! Would love to try the ultra shoulder wrap. I love the puppy mittens! How adorable! I like the bear paw mitts, too funny. So cute, my daughters would love this! I would also love the Spa Warming Wrap for myself. I would love the warming blanket! I’d also love to have the Large Kitten because I have another little one who LOVES cats! I would love the warming blanket and anti-stress shoulder wrap. Very nice products! I would like one of each of these adorable, warm critters….love Beary and Woolly…all of them. Can’t beat cuddly heat therapy! 🙂 Thank you. Everything looks so comfy and cozy! I think I would like the SPORTS THERAPY WRAP. The warming blanket looks really nice! also loving the plaid background here! These warming buddies are the cutest! I’d like to try the warming body wrap too! The Ultra Shoulder Wrap looks like it would be amazing for combating my shoulder pain. I’d use the anti-stress shoulder wrap. I really like the Warming Socks! Being a Diabetic, my feet get ice cold. Hopefully they could help my icicles! I love penguins & it is adorable but for snuggling for my granddaughter, the adorable Large Labrador would be best for snuggling. The Ultra Spa Robes are just lovely. Love to try the Warm Buddy Warming Blanket! I’d love to have the Warming Socks in Cream Sherpa. I also like the Body Wrap. I would like to have the spa warming wrap. My older dog would love the Pet Warming Wrap. The bear paw mittens! They’re so cute! I like the Aromatherapy Sleep Mask as well. The bodywrap looks lovely. Thanks! I would make good use of the Anti-Stress Shoulder Wrap for sure! I love the Ultra Spa Robe. I would love a warming pillow. I really like the Sleepytime Sheep. I would also like the Bear Paw Mitts and the Ultra Spa Robe from Warm Buddy. The warming blanket or wrap! I love the large kitten warming buddy! I really like the Pet Warming Wrap. I have an older dog that needs it. I like the sleepytime sheep. I like Little Tan Bear. The ultra shoulder wraps look amazing! The Ultra Shoulder Wrap would love to win. The Warming Socks are where it’s at. All the cool kids are wearing Warming Socks and cozy cabin socks. I love the pet warming wrap! I love the Aromatherapy Eye Pillow . I have one now but it is very old. Really need a new one. Warming Socks would be nice for the arthritis in my feet. Those spa robes look so comfortable, and I really need a new one! I like the warming blanket! I like the sleepytime elephant. I would love the warm blanket, for the buddies I love the Labrador in brown. I love the Bear Paw Mitts, they are so adorable. Oh my goodness! The Warming Socks love wonderful!!! Ultra shoulder wrap sounds good. I like the Aromatherapy Sleep Mask I can’t stand light when I sleep. I also like their Warming Socks. Cream warming socks are on my christmas list this year! So many awesome items but really love the warming socks in the charcoal color, thanks! These are so cute! I also like the warming blanket. I definitely need to get myself one. my daughter would love to cuddle this bear at night! I believe this world help my aches n pains. I would love to try the anti-stress shoulder wrap. These are all great products!! Anti-Stress Shoulder Wrap would be great. The anti-stress mist is the product I would like to try. I like the Warming Socks. I would love to have one of their ULTRA SPA ROBES – 7006!! They are stunning looking…so soft and luxurious! The warming socks look amazing. They would be great on cold winter days/nights. We have all ceramic floors so socks are a must. I love the warming socks, blanket, and slippers. I love the warming socks! Everyone in my family would! It is no surprise that they are sold out! I also like the Ultra Shoulder Wrap. I love the Ultra Spa Robes. Thanks! I really like the Ultra Spa Robes!